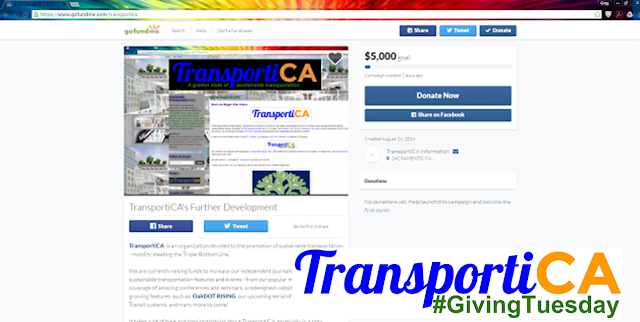 TransportiCA: Consider TransportiCA for Giving Tuesday! Consider TransportiCA for Giving Tuesday! TransportiCA is always excited bringing you timely news and information regarding sustainable transportation. Whether it is through news postings, original content, covering major conferences, and the like, we work hard to bring you the latest and greatest developments in mobility meeting the Triple-Bottom Line. However, in doing so, TransportiCA's efforts require a significant investment of time and financial support to carry-out such operations. We currently do not sale advertising, or provide related commercial opportunities, which could compromise our objectivity in reporting. To continue our neutrality, we have established a GoFundMe campaign to assist with the administration of TransportiCA. Absolutely no funds go to salary or other personnel expenditures, but only to programmatic costs and their administration. You can also donate via our PayPal account - please use the email address: info@transportica.net. For more information on the campaign, or to donate, please visit our TransportiCA's GoFundMe site. Please note, as TransportiCA is not a non-profit organization - 501(c)(3) or (c)(4), donations are not tax deductible at this time.